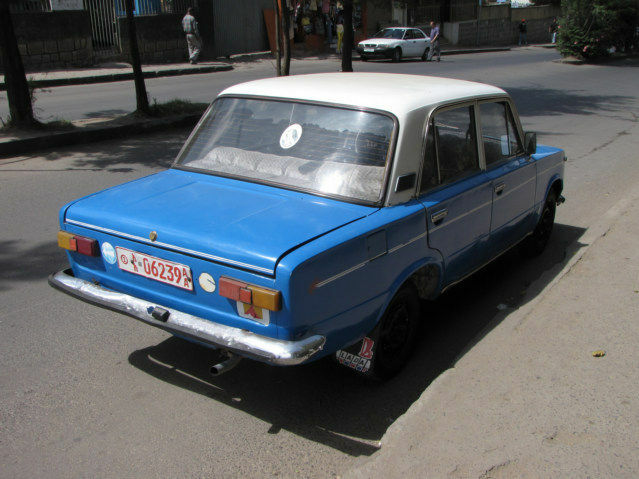 The Brand or Mark of this car is “Lada,” if you look close; the mud flap has the word “Lada” written on it. I believe the majority of the taxis are older; they are missing the “Lada” emblems on their sides. I can find the word “Lada” on the steering while and on the front grill. I was expecting it to be a Korean car and was surprised to learn about this Russian mark called Lada. I would feel more inclined to support the American car manufacturers in their 2008-9 Economic bailouts if this was an American car. Mercedes, BMW and Volvo are expensive cars, however they are sold around the planet, and I seldom see an American car outside the USA. The automobile industry is a multinational business, this means they have to compete with multiple nations. I feel that any business that can dominate the world also will dominate the USA. Made in the USA is great, however sold outside the USA is better. This is the game we are playing, we want to export more than we import. Capitalism, free markets, merits and competition, this is the foundation of the USA economy; I truly hope we allow it to work. I believe the free market system will eventually evolve to where all countries are of equal development and economic standards, without this system, it seems to me that underdeveloped nations have less chance to develop or all the others develop and the USA stops.